I’ve been working on Kollecto for 11 weeks. During these 11 weeks, I probably edited 1-2 lines of HTML, but in general, I built Kollecto without an ounce of code. 30% Email– My Advisors communicate with clients & galleries via email. I created a myadvisor@artkollecto.com email address, which gets cc’d on all advisor-client interactions. This allows me to gather qualitative feedback from clients, cull best-practices from Advisors, & schedule war-rooms with Advisors when something in the customer experience is not right. 4% Plasso + Stripe– I use Plasso to create customized monthly payment plan pages for each of my clients. 3% Paypal– to send money to artists & galleries. 3% VLine– A video chat solution where neither party has to download a plug-in. I started Kollecto assuming most people would want to chat with their Advisor, but I was wrong about that. Most people want to communicate via email so I’m phasing out my use of VLine. 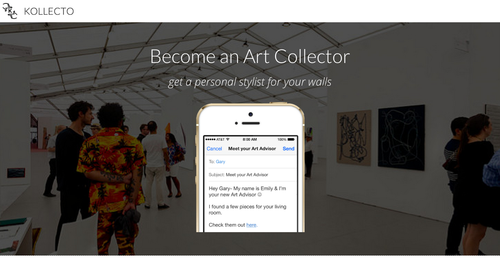 When I started Kollecto, I envisioned a tech-heavy platform for matching first-time collectors with an art advisor. I’m so glad I didn’t start writing code for that… (turns out that first-time collectors don’t really care who their art advisor is as long as he/she can find them cool stuff). Spending 0% time on coding and 100% of time learning what my customers want has been really rewarding & successful. Next Next post: Ready, Aim, Scale! The idea behind validating without writing software (or anything extra costly and/or slow process) is the way to go. However, you are *not* building software without writing code. You are using pieces of software that was meant to be used as such. You might be building businesses (or at least services) without writing code (or building software), but that’s different.